Joice Teurai Ropa Mujuru, the first female Vice President of the Republic of Zimbabwe and Second Secretary and Vice President of the ruling party ZANU (PF). At independence in 1980, Mujuru became the youngest cabinet minister in Mugabe's cabinet. In 2004, the ZANU-PF Women's League put Joice Mujuru ahead as their leading female candidate for the party's vice-presidency. Mugabe bowed to pressure from a ZANU-PF faction led by Mujuru's husband, General Solomon Mujuru, to give a woman the second vice-presidency post position. Growing up in Mount Darwin, Mujuru completed two years of secondary education before leaving for Zambia to join the liberation struggle. Taking the pseudonym Teurai Ropa (spill blood), Mujuru rose to become one of the first women commanders in Mugabe's ZANLA forces. At independence, she continued with her education despite the demands of the home, family, political and ministerial offices. She graduated with a Bachelor of Science Degree in Management and Entrepreneurial Development from the Women's University in Africa. Currently she is pursuing a Master of Science degree in Strategic Management, leading to a PHD. 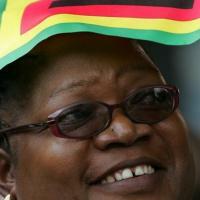 She is married to General (Rtd) Solomon Tapfumaneyi R. Mujuru and has four children and seven grand children.